I've just answered a question posed online about "why do large companies pay late?". Firstly its worth mentioning that this does not apply to all large companies. We deal with numerous financial services companies who tend to pay very quickly. There are a couple of key reasons for some large companies paying late, which are explained below. Despite there having been a tightening up on large companies, adding the right to receive interest on late payments and requiring them to publish average payment periods, the problem still persists. These are some of the reasons. 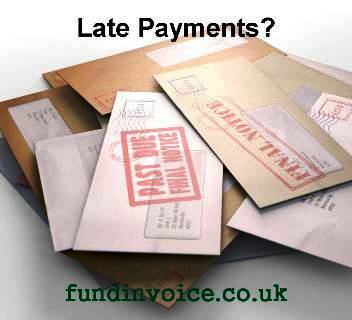 The biggest reason for making late payments to your suppliers, is to benefit your own cash flow. If you have a situation where you are paying your suppliers say £100,000 per month, paying on cash terms (immediately you purchase without taking any credit period), in month one you have to pay out £100,000 from your cash flow to settle these debts. In month 2 your pay out another £100,000 etc. Let's assume your monthly income covers that amount but that you don't get paid until month 2. In the first month you will have to finance those purchases e.g. with an overdraft of £100,000. If instead you take 30 days credit from your suppliers i.e. you don't pay until 30 days have elapsed (let's assume thats a month to avoid the complicated maths! ), in month 1 you have created an additional £100,000 within your business cash flow i.e. you don't need that £100K overdraft as you don't pay anything until, in the above example, your customers have paid their month 1 debts. If you continue to take 30 day terms, this additional cash flow benefit will be retained within your business. If you instead decided to take 60 days to pay (roughly 2 months), The benefit would accrue as follows. In month 1, you would not have to pay out the first £100,000 (i.e. no £100K overdraft). Then in month 2 you would not pay out a further £100,000 (meanwhile your customers continue to pay you, creating a credit balance). This would produce a c. £200,000 benefit to your business cash flow. In the case of a large company, you only have to multiply up the numbers up to realise the significant benefit it can be for them to take extended periods of time to pay. Indeed, in situations such as the collapse of Carillion, when their cash flow problems were at a peak, just before their collapse, they started taking 120 day terms from suppliers which would have significantly improved their own cash flow situation. Sadly, it was not sufficient to save the company, but this example helps to demonstrate the principle. The second reason for taking a long time to pay your suppliers can be administrative reasons. If you are dealing with a large company, it is often not a simple case of the owner of the business deciding that invoices are due, and making a payment. Often the payment process can involve numerous different departments – such as purchasing, payments or finance. There may also be numerous levels of approval required, depending upon the size of the expenditure. This could require several different people to look at a particular purchase and authorise it, all before the payment is made. Some large companies require you to adhere to their own payments process. If you make an error this can cause a delay. Some companies e.g. RBS have their own payments system that suppliers have to log into in order to get their payments released. If you don't follow the protocols for large companies, or provide the information required e.g. order numbers for example (in some cases), there may be delays. It is important to understand your supplier's full payment process at the outset of the relationship. If you are dealing with local authorities, administration can be one of the main problems when seeking to get paid. We have some advice in our article regarding Getting Paid By Local Authorities. Get your paperwork right e.g. invoices correctly raised with all the information they need, sent to the right person, with any approvals required. Understand their payment process in advance, and follow it meticulously. Operate an effective credit control system, or employ a professional outsourcing service. Charge interest on overdue debts. If you would like more information about how to operate an effective credit control system, and about charging interest on overdue debts, we have a free credit control guide on our website. If you are in need of assistance, either in terms of funding the gap between raising invoices and getting paid, or collecting in your invoices, we will be happy to assist you in finding a provider that can offer that service, at the best possible price.